Virginia Beach Va. – The Virginia Legacy 76 are off and running in the Mid-Atlantic conference playoffs. #1 Seed VB City FC hosted the #4 seed Virginia Legacy 76 in the first round of the conference playoffs, Wednesday July 12th on Veterans night at the Virginia Beach Sportsplex. Virginia Beach City FC has only lost once at home in the 4 years of the franchise and leading into the game. Legacy, straight off a 3-3 tie with Fredericksburg FC, headed into the match confident and with nothing to lose. The Undefeated VB City would have been wise to take notice of Jimmy Grace’s hat trick against Fredericksburg, as history tends to repeat itself. Jimmy Grace, the Legacy captain, started his scoring account early in the eighth minute, netting a left footed finish from the skilled assist of Jermain Reid. Seven minutes later VB City scored from one of their 11 corner kicks they would have of the evening to even the score. In the 30th minute, Grace found himself in the corner with a defender to beat. Grace got by him, forcing the VB defender to foul and drew a penalty kick. The captain took the kick himself and put the away team back up 2-1. With little less than 15 to play in the half, Legacy began to focus all efforts on holding the lead into the half. The heroics of the team were not limited to just the captain. The Legacy back line: Marcel Berry, Ryan Flesch, Alfonso Speed, Henry Gotay, and keeper Sam Onyeador took over. The Legacy sides conceded 11 corners on the evening and had help from the goal post on several occasions, but were relentless in their efforts. VB City’s best chance to equalize came in the 80th minute as a VB city shot stretched Onyeador to deflect the ball to the far post and bounced in front of a fellow VB City Striker. As the ball was teed up the VB player with an open net, Legacy defender Marcel Berry dove in and played the ball over the bar. As the game entered the final minutes, Grace wasn’t content with holding the lead at one. In the 88th minute, Grace intercepted a pass along the back line of the VB City defense and took it immediately to goal. Grace approached the one on one opportunity with the VB keeper and calmly placed the ball into the far corner making it 3-1 and promptly deflated the home crowd. Jimmy’s third goal of the night gave him 6 goals in 2 games, his second consecutive hat trick, and his second consecutive player of the game. 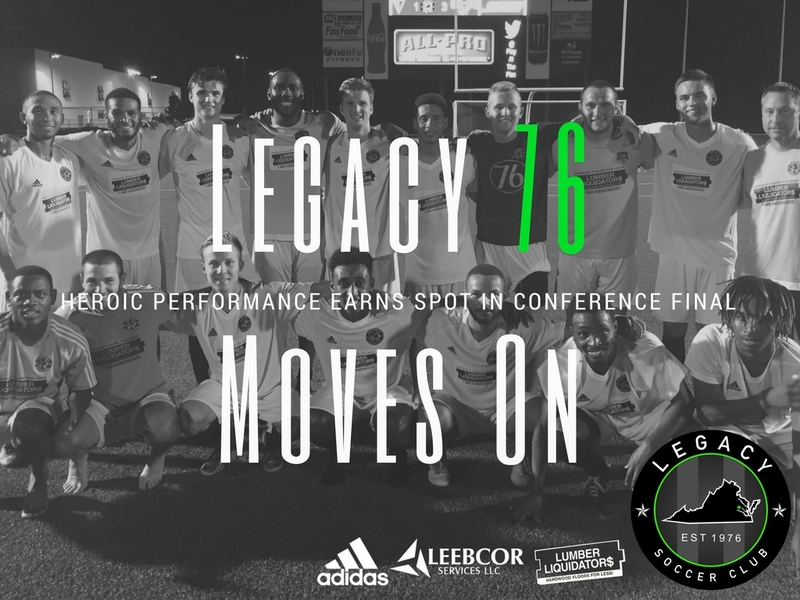 Legacy 76 will now travel to Frederick Maryland July 15th, to play FC Frederick at Hood College - 4pm, to play in the NPSL Mid-Atlantic Conference finals.